Salve Mater Ecclesiæ! | Flickr - Photo Sharing! 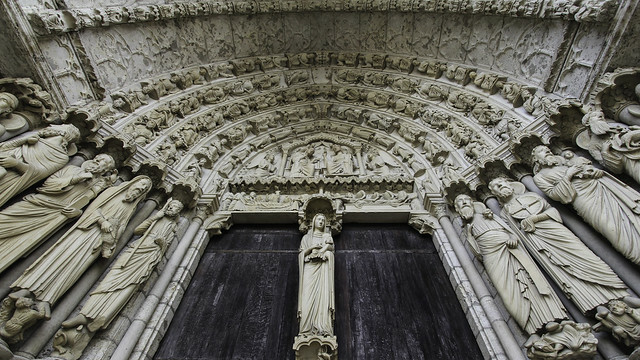 The portals of the north transept of Chartres Cathedral has Our Lady in the centre, with the prophets looking towards her. This is the side of the Old Testament which has its fulfilment in Mary, Mother of God. As Holy Mother Church brought the Faith to the northern lands, so Our Lady stands here facing the north, and she holds out the blessed fruit of her womb, Jesus Christ; she is the first preacher of God's Word made flesh. May Mary, Mother of the Church, be our refuge and shelter! Stephen L D'Agostino, beery, and 28 other people added this photo to their favorites. Beautiful! I sat for an hour just looking at this door.